We used the GSN broadband data downloaded from the IRIS DMC (http://www.iris.washington.edu/). 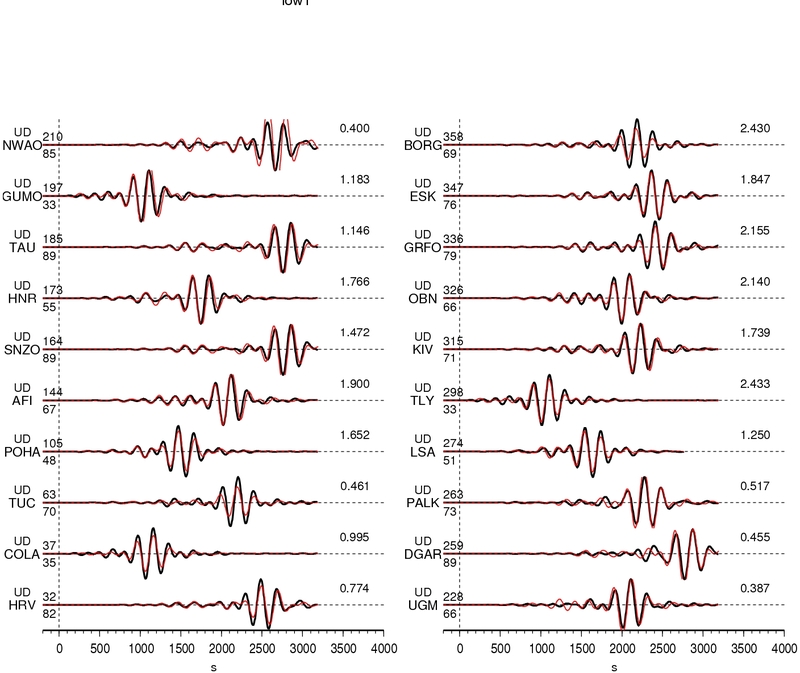 We selected 21 teleseismic P and 17 SH body waveforms, which were first converted to displacement by removing the instrument response and then bandpass filtered from 2 sec to 330 sec. 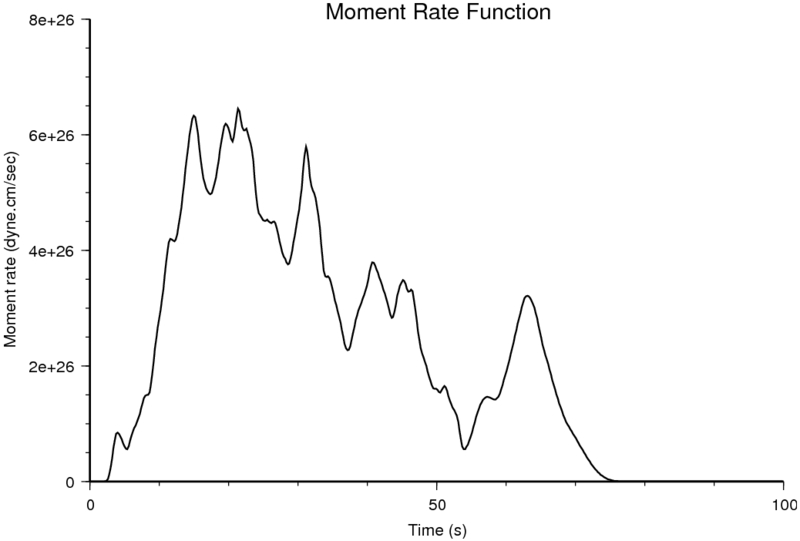 The time window used in this study is about 160 sec. 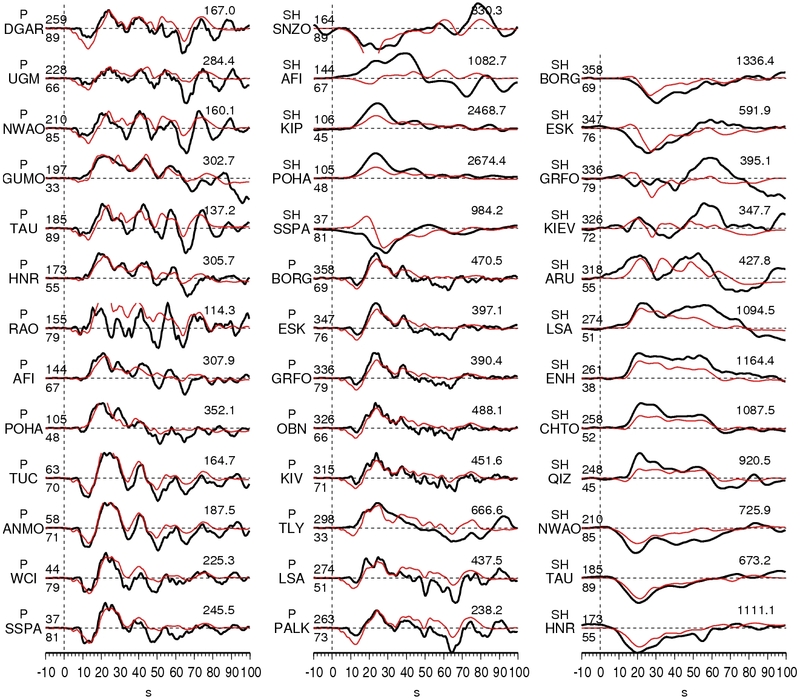 We also included 20 long period Rayleigh waves and 19 long period Love waves into inversions. We defined the fault plane using the hypocenter location of the USGS (Lat.=46.29 deg. ; Lon.=154.45 deg. 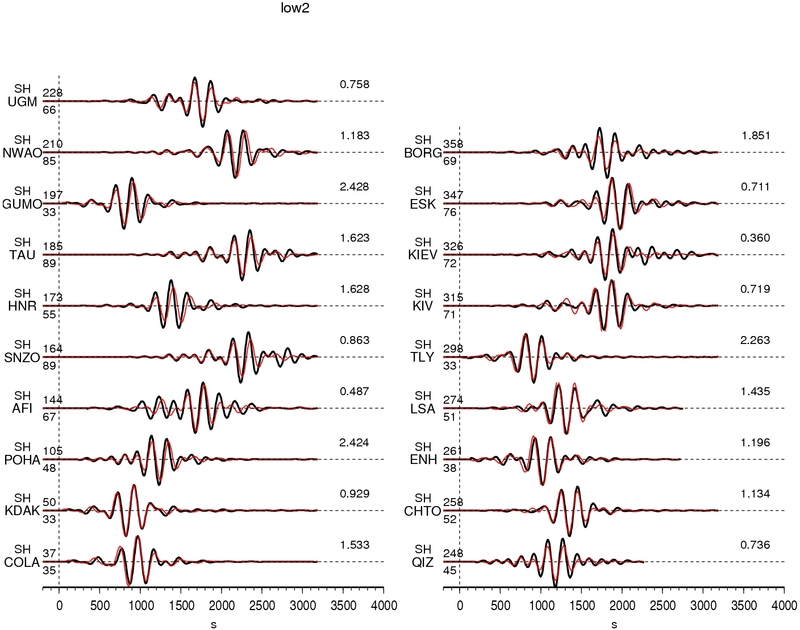 Depth = 10 km) and the moment tensor solution of the GLOABL CMT (http://www.globalcmt.org) after evaluating them with very long period seismic waves. The hypocenter depth has been shifted (18 km) to match the body waves. We constrained its rupture process using a finite fault inverse algorithm in wavelet domain (Ji et al, 2002, 2003). 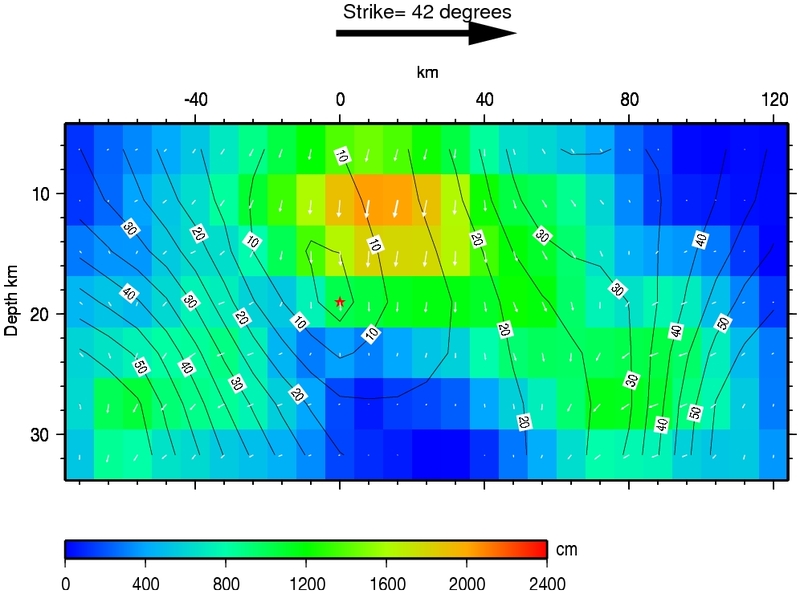 We selected the high angle nodal plane (dip =57.89 deg., strike=42 deg.) as preferred fault plane based upon aftershock distribution. Its dimension is 200 km (along strike) by 35 km, which is further divided into 175 subfaults (8 km by 5 km). The seismic moment release of this model is 1.9x1021 N.m and its peak slip is about 20 m using a 1D PREM model. 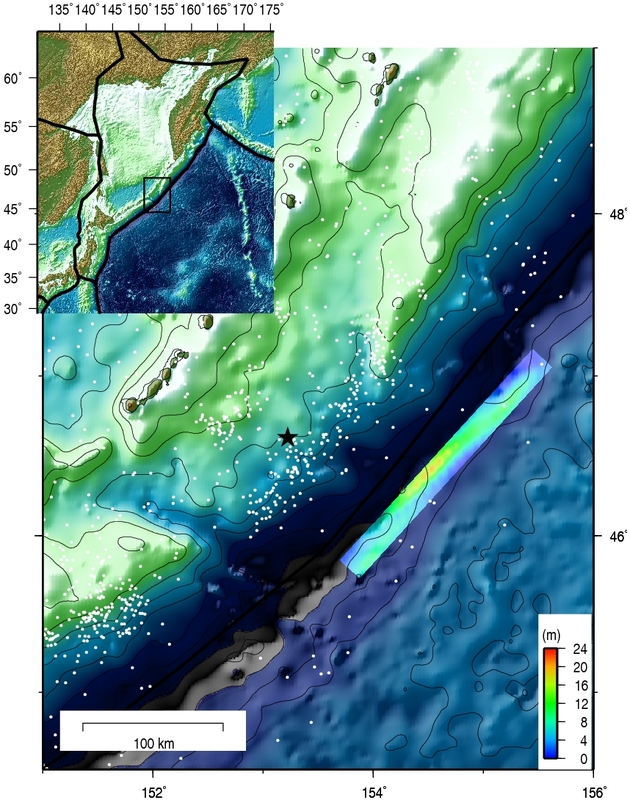 Figure: Surface projection of the slip distribution superimposed on topography and bathymetric map ETOPO2. The red contours shows the slip distribution. The black line indicates the plate boundary. The white dots are background seismicity from 1964 to 2004 (Relocated ISC catalog, Engdahl et al, 1998). I test the focal mechanisms following the trench axis but with smaller dip angles. It could explain the body waves fairly well but fail to simultanouesly explain the long period Love waves.